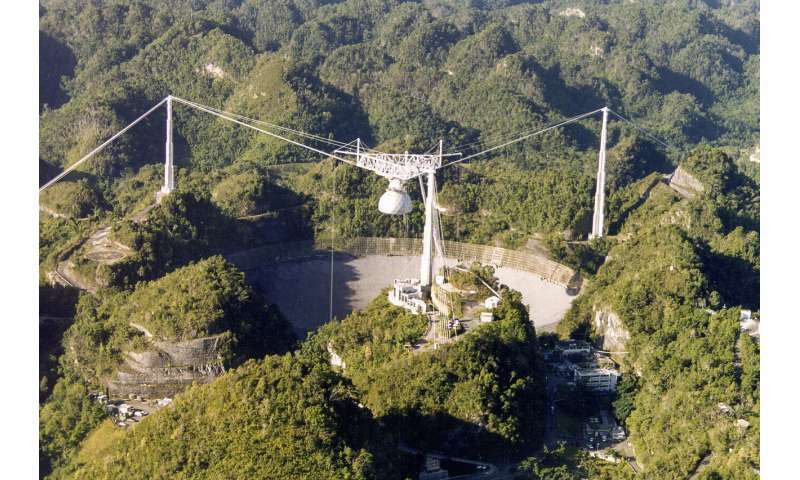 The Arecibo Observatory in Puerto Rico is the site of the world’s second-largest single-dish radio telescope. Credit: Arecibo Observatory, a facility of the National Science Foundation. Maura McLaughlin and Duncan Lorimer, professors of physics and astronomy at West Virginia University, have discovered a new pair of pulsars and have followed up on characteristics of another new duo. Their research will bring insights into the understanding of the how many of these systems exist and the rate in which they merge in our galaxy. Pulsars are rapidly rotating neutron stars, the remains of massive stars that have exploded as supernovae. When two pulsars orbit each other, their trajectories can be highly elliptical, much like Mercury's orbit around the sun, but the gravitational attraction between the two massive objects pulls them gradually closer until they merge. The collision is so immense that it sends ripples through space and time. "These pulsars are moving very rapidly around each other," Lorimer said. "So rapidly, in fact, that they're starting to test our understanding of gravity." There are 2,500 pulsars of all types in the Milky Way, but among them, binary systems are rarely found. Scientists have discovered just 15, but they believe there could be as many as 100,000. McLaughlin and collaborators from universities in the U.S. and abroad discovered a new binary system in a long-term survey using the Arecibo Observatory in Puerto Rico. "The discovery of double neutron stars orbiting each other is important," McLaughlin said. "But our discovery is also extreme in the sense that it has a short orbital period, making it potentially exciting for tests of gravity." The binary orbit for this discovery is 1.88 hours. This is the shortest orbit of any double neutron star binary system. By observing binary systems, scientists gain understanding of extremes – such as densities and magnetic strengths – that do not occur on Earth. This new discovery lends a new understanding of Einstein's Theory of Relativity and the understanding of gravity overall. In some cases, neutron stars in binary systems are so far apart that they don't merge and will not significantly change in separation over time. But in six of the systems, the pulsars are moving so quickly and their gravitational attraction is so strong that eventually they will merge. "They are approaching each other very gradually, a few millimeters a day between each of them." Lorimer said. "What that means is that 100 million years from now – which is not long from an astronomer's perspective – they will collide." So, what is the result of two neutron stars merging? The merger of these two massive, dense objects is as spectacular as it is violent. As their orbit becomes tighter, they end up ripping each other apart, losing energy that is emitted in the form of gravitational waves. Last fall, the Laser Interferometer Gravitational-Wave Observatory, known as LIGO, directly detected gravitational waves from a collision of two neutron stars located beyond the Milky Way. Sean McWilliams, assistant professor of physics and astronomy, and Zachariah Etienne, assistant professor of mathematics, and several WVU graduate students are part of the LIGO research team. By observing the collision of the neutron stars, the scientists can understand how extreme matter, extreme gravity and electromagnetic energy interact with each other. "The binary systems that scientists are discovering in the Milky Way are prototypes of these violent mergers that instruments like LIGO are detecting beyond our galaxy," Lorimer said. "There is a lot we can learn from that." Pulsars are extremely dense, and as they spin, they emit beams of radio waves that sweep through space, much like signals from a lighthouse. Scientists use radio telescopes, which are extremely sensitive scientific instruments to detect that electromagnetic radiation from deep in space. In the initial data, there is little difference between regular pulsars and binary systems. But there are hints in the measurements of the rotation period. "In a binary system, you typically do not see both pulsars, because usually only one is pointed toward the telescope," Lorimer said. "But you see a spin period that is typically much smaller than an average pulsar and is rapidly varying due to Doppler shifts and the neutron stars orbit each other." In the Arecibo survey, the telescope used seven cameras to systematically observe different patches of sky at given times, allowing the instrument to cover more sky than normal. Over nearly 15 years, the survey has detected 170 pulsars. McLaughlin, Lorimer, and WVU graduate student Nihan Pol followed-up on another new binary system made by researchers at the Max Planck Institute for Radio Astronomy in Germany that used survey data from the Parkes Telescope in Australia. Scientists conduct follow up research with every pulsar, but when researchers from the Max Planck Institute quickly realized that they had discovered a new binary system, they wanted to conduct more in-depth measurements. McLaughlin and Lorimer used data from the Green Bank Telescope to determine the approximate parameters of the system, such as its orbit speed, arrival times and decay. "We have to do systematic follow-up observations and try to understand as much as we can measure about these objects. Eventually we'll see changes or signals that help us map out the orbit," Lorimer said. "It's a long-term process. It takes about a year to disentangle the effects of Earth's orbit." Both systems are now giving us new insights into the rate at which double neutron stars merge. The system discovered with the Arecibo Observatory is in a very circular orbit whereas the system discovered with the Parkes Telescope is in a very eccentric, oval-shaped orbit. Knowing about their properties, and the properties of other systems, is providing better constraints into scientists' understanding of the merger rate in the Milky Way. McLaughlin, Nihan Pol, and Lorimer are using that information to make predictions on the expected rate of detection of gravitational waves from double neutron star mergers in the Local Universe with LIGO. Their estimates show that LIGO should discover many more double neutron star mergers over the next several years. "This will provide us with a complementary picture of these energetic events both in electromagnetic and gravitational waves and also give us even more insights into how extreme gravity works", McLaughlin said.